Speaking in Israel, Ambassador Samantha Power says Iran is still helping fuel conflict in the region and thus remains a threat. 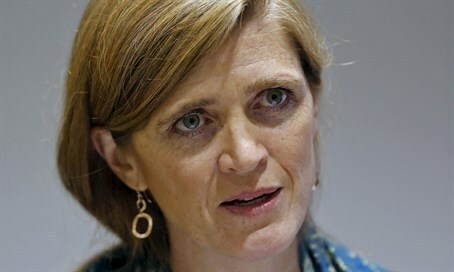 Washington's UN ambassador Samantha Power said on Monday that compliance with the Iran nuclear deal was so far "strong", AFP reported. At the same time, she also warned Tehran was still helping fuel conflict and remained a threat. "What this deal does if implemented -- and so far the implementation has been strong but it's very early days -- is it cuts off the pathways to a nuclear weapon and it gives us much more visibility into Iran's program than we had before," Power told students at the American International School in Even Yehuda, Israel. She added later that "Iran of course is still a threat. Iran is supporting terrorism. Iran is supporting parties to conflict like the Assad regime (in Syria)". The agreement reached last summer between Iran and the permanent five members of the UN Security Council plus Germany was recently implemented, after the International Atomic Energy Agency’s (IAEA) announced that Iran met its initial obligations under the terms of the deal. Israel strongly opposed the deal with Iran, with Prime Minister Binyamin Netanyahu warning it would not block Iran's path to nuclear weapons. He also said lifting sanctions would allow Iran to further back its proxies in the region, including the Lebanon-based Hezbollah terrorist group. Netanyahu's outspoken criticism of the accord, particularly in a speech to Congress, led to a rift with President Barack Obama's administration. But he has since scaled back his rhetoric, and the United States and Netanyahu's government are currently negotiating a new 10-year defense aid package expected to be an increase over the current $3.1 billion Israel receives annually. Power has met Israeli and Palestinian leaders during her visit, expected to end Tuesday. Earlier on Monday, she met with President Reuven Rivlin at the Presidential Residence in Jerusalem. During the meeting, the Israeli President emphasized that a solution to the Israeli-Palestinian conflict cannot be imposed by outside powers, calling for direct negotiations between Israel and Palestinian Authority (PA) chairman Mahmoud Abbas. "The conflict between us - the tragedy between us - can only be solved through direct negotiations," said Rivlin. "No solution can be imposed on either side, and we must negotiate to come to an understanding."